In his “Sathya Sai Baba – Life, Love and Spirituality” blog” Gerald Joe Moreno of Las Cruces, New Mexico, USA, makes a number of entirely false claims. In his very language and conduct he ceaselessly infracts the teachings of the one he defends. The is the constant use of name-calling, labelling, derision, sneering, demeaning, assuming the very worst of all those who criticize his idol Sathya Sai Baba and, indeed, amid the anarchy that resides within parts of the Internet, severely libeling one after another who stands forth to question him and his worldwide cult. Among a plethora of sites, which he manipulates in such a way as to leap higher in Internet search engine results, Gerald Joe Moreno has a WordPress.com blogsite: sathyasaibaba. It operates under the pseudonym Equalizer. Whatever top class broadcaster (e.g., BBC, CBC, SBS, Channel NineMSN) or newspaper (e.g., Times of London, Telegraph, Guardian, India Today, Ottawa Times, The Age, etc.) investigates Sai Baba and his organisation is fair game for Gerald Joe Moreno’s attacks. Moreno always right. Critics always wrong. Recently, a leading national broadcaster screened the Australian Current Affair report ‘Infiltrating a Cult’, February 2, 2009, on Channel NINEMSN. It showed an Australian Sathya Sai Baba cult leader, Moyia O’Brien, denying that the Sai Baba organisation is religious but only a social service organisation. To view the ACA Chris Allen interview and accompanying footage of the violent cult-hired security guards, ‘Infiltrating a Cult’, click HERE. Moreno is on a par with the Sai cult leaders round the world, including Ms O’Brien in the Australian television interview, who plays down – or rather wilfully deceives about – her close affiliation with the Sathya Sai Organization. 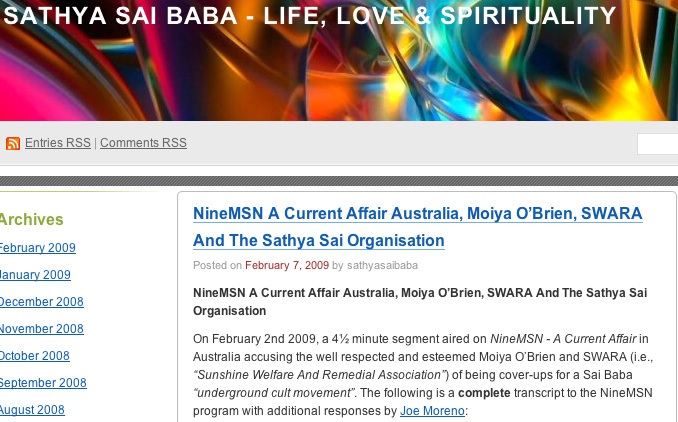 (see the original video and report here) NOTE: A reliable source from within the media has confirmed that Channel NineMSN withdrew the presence of its ‘Infiltrating a cult’ segment because the Sathya Sathya Sai cult threats of legal action. Media around the world, including SBS and The Age in Australia have refused to be intimidated by the powerful Sathya Sai Organisation. We will not be intimidated and continue to make available the footage! This entry was posted on March 12, 2009 at 11:27 pm	and is filed under Gurus, Hinduism, India, Opinion, Sathya Sai Baba, Uncategorized. Tagged: Equalizer, Joe Moreno, SWARA. You can follow any responses to this entry through the RSS 2.0 feed. You can skip to the end and leave a response. Pinging is currently not allowed.